Supposing you transfer AVI files to Mac computer from Windows PC and finding you can't play avi videos on QuickTime Player, or import avi files into iMovie for further editing. Ever since AVI first came to the world in 1992 for Windows Software, AVI has become one of the most common video file formats. This file simply contains audio and video data, capable of holding all kinds of different video qualities, from standard to high-definition videos. However, this format is not well received by Mac-based programs, as most Apple applications support formats natively on Mac, namely M4V, MP4 and MOV. For the bad incompatility of AVI on Mac, Mac users have to convert avi videos to MP4, MOV, M4V etc to play them smoothly. In other words, a good AVI file converter for Mac is required. In this article, we will introduce you 2019's best free AVI video converter for macOS (Mojave supported). 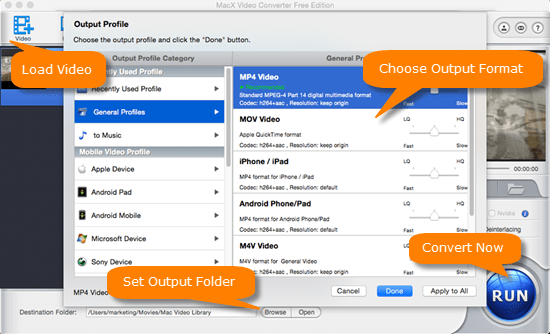 To find a right Mac-based AVI video converter in 2019 to diminish the difficulty in converting videos like FLV, MP4, MKV to AVI format on your Mac OS is easy. In fact, both Handbrake or VLC will do the job. But considering the limited output files and complicated operation of both programs, here we recommend you another free AVI video converter for Mac: MacX Video Converter Free Edition. This AVI file converter for Mac is totally free yet 100% clean while supporting the latest Mac version - macOS Sierra. What's more, Mac users can use this 2019 free Mac AVI video converter to easily and freely convert AVI to MP4, MOV, M4V, MKV, WMV and any other formats, compress AVI videos to smaller size, as well as convert any videos from a variety of source formats into AVI files. The AVI converting on Mac will be done with fast speed and 98% quality reserved. Therefore, you'll no longer hit roadblocks in AVI file conversion on macOS. Download the free AVI file converter on Mac, click "Add File" button to load the AVI videos (or other format if you're converting videos into avi). To convert AVI format to mp4, mov etc on Mac platform, hit the target format from the profile list. The optimized default settings ensure the best output quality. More than expected, it also supports you to free convert AVI to MP3, AAC, ringtone if you need audio only. Step 4: Start video to AVI Conversion. Click the "RUN" button at the lower right corner to begin AVI video conversion on Mac so as to play AVI on Apple TV, iPad, iPhone, etc. For more video conversion, its advanced version MacX Video Converter Pro wraps up every you need in AVI video conversion on Mac, helping you not only download videos from YouTube, Facebook, Vimeo, Dailymotion, Vevo, Metacafe, etc, but also serves as AVI to MP4 converter for Mac that can convert video to AVI, MP4, MKV, WMV, FLV, iPhone 6S/6S Plus, iPad Pro/mini 4, Android, etc easily. Ultimate free Mac AVI video converter to convert AVI to MP4 MOV M4V 3gp etc for playback on iPhone 7/7Plus, iPhone 6S/6S Plus/6/6 Plus, iPad mini 4/Pro 15X faster, original quality.